Hello Revuers! It’s Tuesday which means it’ time for another edition of New Comic Book Day Top 5. Where I pick my top 5 most anticipated books that are coming out this week. This Wednesday looks to be especially exciting with many new series’ starting from major and indie publishers alike. As always feel free to tell me what you think of the list in the comment section below, and please tell us what’s on your pull list. We love to hear from our readers, plus I love finding out about new series’ that people are enjoying. Without further delay, let’s jump right in. The Skeptics is a new series from the fantastic Black Mask Studios features the talents of Tini Howard (Writer) and Devaki Neogi (Artist). The story is summed up as follows: “A stylish, political adventure about a pair of hip, clever teens who fool the world into believing they have superpowers. It is the 1960s. The Russians have the A-bomb, the H-bomb, and now the most terrifying weapon of all: a pair of psychically superpowered young people.” The story then focuses on the heads of the USA military looking to find equivalent super powered beings from America to be on Par with Russia. The preview art for this series looks amazing and the premise promises to be a wild ride. Batgirl #4 is a continuation from issue three. Batgirl realizes that she has fallen into the trap set by The Teacher. She realizes that in order to save Kai she will first have to come face to face with this new mysterious villain. Writer Hope Larson has delivered an interesting and compelling plot so far this series. I think the title overall benefit from being on the slower once a month schedule. This allows the artist Rafael Albuquerque and Color Artist Dave McCaig time to really build a beautiful and rich world around Hope Lasron’s world. Batgirl is still one of the best titles from the overall spectacular DC Rebirth initiative. Confession from me. I have been a big Spider-Man fan since I was 7. In fact Spider-Man was/is my favorite superhero. The Prowler was also one of my favorite Rouges in his gallery (Mysterio is my favorite [maybe I just really love purple and green color schemes for villains!?]). So when I heard they were planning a Prowler solo series I was pumped. I had already been excited about him getting more of a role in the new (NOW!?) ASM series. Writer Sean Ryan and Artist Jamal Campbell have a lot on their plate but the preview art makes it look like they have delivered. I can’t wait until I can read this one. This new Dr. Strange series arrives two weeks before the release of the Marvel Studios film. Coincidnece? I think not. Do I care? NO! Robbie Thompson is set to write the series which means it’s going to be fantastic. I love the way he tackled Silk and Spidey, so I can’t wait for him to take on Dr. Strange. The art will be by the amazing Javier Rodriguez, who has recently been on the Spider-Woman series. If there’s one character that I think working on a Spider-Man series before hand would benefit you it would be Sr. Strange. There’s a lot of room for humor and sarcasm just like in Spidey titles. I am also intrigued by the team up aspect of it. The idea of Dr. Strange in a mentoring role is hilarious to me. Bloodshot USA comes to us from Valiant Entertainment. It features the all star level talent of Jeff Lemire (writer), Doug Braithwaite (artist) and Brian Reber (Color Art). The story is set in New York where a criminal organization has released a biowarfare weapon that has turned the population of New York into blood thirsty zombie like creature, and it’s up to Bloodshot to ensure the contamination doesn’t spread. This title just sounds like plain fun, shoot em up comics to me with no shortage of action. The preview art looks incredible. Especially the color art work by Harvey nominated color artist supreme Brian Reber (wow, that was quite the run on sentence). I haven’t read too many Valiant series’ but this one looks like a real winner. Hello Revuers. Welcome to another edition of Covers of the week. I hope you are enjoying this segment so far. If you are (or aren’t) let us know in the comments below. Thank you! Without further ado let’s jump right in. This has been the week of Batgirl here at Deja.Revue, first Batgirl #2 was the most anticipated book of the week. Then it was the Pick of the week. Now it’s our regular cover of the week thanks to the spectacular work of Rafael Albuquerque. I love the striking bright colors and the facial expression on Batgirl’s face. The shaping of the figures really conveys a sense of movement and action. The series its self is wonderful and I highly recommend it. I recommend you check out our review of issue 2! Batgilr #2 was my most looked forward to book of the week in the first ever New Comic Book Day Top 5, and it did not disappoint. Picking up where last issue left off we find Batgirl in Singapore chasing down a purple drone that’s making it’s getaway. Batgirl wonders if this drone is on a secret mission to gather information about her and her traveling partner Kai (whom Batgirl has history with). It turns out that the drone is nothing as Batgirl follows it back to it’s base and it turns out to be operated by a simple pervert. Not quite what Batgirl expected. During the chase scene Batgirl repeats the mantra that the Fruit Bat told her “You can’t see the future when the past is standing in your way”. This comes in to play later in the issue. Batgirl then uses her photographic memory to replay the fight she had with the killer schoolgirl from the previous issue. After playing through that memory a few times she notices a detail that she had previously missed. A tattoo that translates into “pupil” or “student”. Batgirl then wonders what the tattoo means.The following morning she has an awkward and clumsy discussion with Kai, who she realizes she is starting to have feelings for. This leads to one of my favorite pieces of inner dialogue I’ve ever read in a Batgirl comic. The dialogue is Batgirl questioning herself in a vulnerable way, and ending with her saying she needs to see a therapist in a half joking manner. The way Larson writes Batgirl is interesting because there are several moment where we see the vulnerable young adult that Batgirl is, but we also see that even though she is vulnerable (like all of us in the world) that doesn’t make her weak. She doesn’t succumb to the vulnerability, instead she uses it to keep herself grounded and not lose her identity as Barbara Gordon completely to Batgirl. In the first issue the whole reason why Batgirl want’s to go to Singapore is to try out for a MMA group called Adapt. Upon inquiring about working out with Adapt she is first mistaken for a ring girl and then informed that they no longer accept female fighters. After her discussion with the receptionist she is told about a different gym that would train her that is owned by a women named May Hao who, we learn, lived in Gotham up until recently when she returned to Singapore. May promptly accepts to train Batgirl and even sets up a fight for the following Friday between her and MMA Wen Lu from China. This acceptance of Batgirl and setting up of a fight for her seems to easy to me. Combine that with the fact that May used to live in Gotham and something smells fishy here. during the fight Batgirl seems to have an upper hand but (gasp) Wen has a tattoo on her arm that matched the one on the Killer school girls arm, noticing this Batgirl is distracted and knocked out by Wen. I fell like there is more to May than meets the eye. Maybe May is the teacher of these students, or maybe she knows more about Batgirl’s secret mission than she is letting on. Now at the beginning of the review I told you what Batgirl kept repeating from her meeting with the Fruit Bat “”You can’t see the future when the past is standing in your way”, well while Batgirl is training for her fight there is also a montage of a romantic involvement with Kai. While Batgirl is interested in him she is confused as to why. She doesn’t know if it’s because she has a past with him or if it’s because he’s changed. Throughout the issue he trys to show Batgirl how much he’s changed by taking her on a romantic dip in a high rise pool, and telling her he has a real job. The romance of the night won over and Batgirl gave him a kiss. A kiss that she immediately regretted. All of this just confuses Batgirl more and more. I’d tell you what happened but I don’t want to spoil it for you. So go buy this comic and read it for yourself. The art in this issue is excellent Albuquerque continues the stylistic elements from issue one. with backgrounds lacking somewhat in detail adding to the over all style of the book. Albuquerque is fantastic at conveying a sense of movement with his characters. During the fighting montage especially. The punches leap off the page and really make you feel like the are moving. Albuquerque often draws close up on faces in order to draw out emotion from their facial expressions. This issue was very successful in that regard. The color art work by Dave McCaig was superb a well. McCaig continued to use solid color backgrounds to help make the figures pop. This technique works especially well during action sequences. McCaig also uses different palettes to evoke a sense of time to the pages. For instance in the scenes set in morning, he uses a lot of greens and blues to convey a sense of beginning. During the romantic rooftop pool scene it’s set in the evening and palettes witches to a more yellow, orange and brown palette to make it appear as though the characters are being bathed in the last light of day. Overall this issue just works on so many levels. The whole creative team is really jelling well and because of this they have been able to create something that has the potential of being very, very special. Below I have included the two covers the title shipped with. Hello Revuers. This week marks another big victory for the DC Rebirth initiative. Once again I found my pull dominated by DC comics. I counted and I have purchased more DC comics in the last two month than I did all of last year. What has changed with this initiative? There’s hope. Well that, and the comics have been consistently good across the board. I haven’t read a single title that I didn’t like. This week I have three to review. A bit of a light week for me. Hello Revuers, I’m proud to announce that this is our 50th post on Deja.Revue! When I started this site with my roommate back in November of 2014 I couldn’t have anticipated the great response and support from viewers like you. Thanks to die hard comics fan like us, we have grown exponentially over the course of ten months. I could ramble on and on with statistics and numbers and blah blah blah…….but I’d rather just bring you the high quality original content you’ve come to expect from us. Since I’m feeling reminiscent I’ve asked our writers and our guest reviewers to write about their most nostalgic issue or series from their childhood. I’m happy to report that this article turned out to be one of my favorite and I hope its yours too. As usual all names are clickable and you should check out our guest bloggers sites. They are all wonderful. Now, without further delay lets begin our nostalgia filled joyride through our childhoods. Cloak and Dagger are the most basic opposites, light and dark. This is a common trope, and a simple but solid premise that allows the reader to accept these new characters without bogging down the story with exposition. As the story advances, the characters become more nuanced and interesting. Cloak is darkness. He must feed on the light of humanity to satisfy his cravings or suffer the maddening effects of hunger. If he does not feed, he will begin to consume his own humanity. Where Cloak is darkness and retribution, Dagger is light and forgiveness. She produces pure humanity in the form of daggers. These light daggers act as a jump start to give a person a chance to redeem themselves before Cloak enacts his more permanent form of justice. However, Dagger’s light is limited and thus can not redeem those too far gone nor can it totally satisfy Cloak’s hunger. In addition to seeking out the wicked, Cloak and Dagger must confront their own personal demons. In issue two, Dagger confronts a man whom she slaps across the room and states “My light knives are too good to waste on the likes of you!”. In retrospect she realizes that she acted without compassion. She must learn to control her emotions to give every person equal opportunity for redemption. Cloak begins to perceive himself as a burden on Dagger, causing him to spiral into a state of self­loathing and harm. Eventually banishing himself to the sewers in an attempt to not affect anyone instead of realizing the potential for good that he possesses. So enough about the series, why do I love it so much? Well let me tell you… Cloak is a badass. He is troubled and dark, and essentially everything he says is the basis of a death metal song. For example: “You have chosen your fate, scum of the street. Darkness seeks darkness. Let you soul now scream – as is greets a darkness greater than its own.” “I am shadow. I darkness deeper than any dungeon. I am called Cloak… and I hunger.” “There is only one law, detective, as this murderer of women and children shall soon discover… the law of retribution.” “I am not a man, detective. I am merely a being who exists from one day to the next – locked in a struggle between hunger and appeasing that hunger. But I have learned that if I am ever to again be a man – that hunger must be denied!” But his darkness dissipates in the presence of Dagger’s light. Both Cloak and Dagger deal with issues that I see in myself. The whole series provokes the idea that neither light, nor dark is the answer the the issues of humanity. Rather, it is a balance of good and evil. When I was a much younger geek I followed my older brother into reading comics; my pull list consisting mostly of random Superman stories and Chris Claremont’s sub-X-Men for DC Sovereign Seven. At some point my brother quit comics in spectacular fashion selling off most of his collection and giving away the rest. One book that I was able to salvage from the flames was Batman: The Long Halloween #1. For some reason unknown to me even now it would be another few years until I actually read the thing, but boy when I did was my mind blown. Here was a comic that showed me what comics could really do; that amongst the kapow-action there could be smart plots and shocking surprises, and it could all be delivered with the perfect grace of Tim Sale’s elegant art. In retrospect it is probably that gorgeous Sale artwork that does a lot of the heavy lifting on an issue by issue basis, keeping things flowing and providing a sublime canvas on which the story is drawn, but I wouldn’t want to do writer Jeph Loeb out of some well-deserved credit either. Sure, when reading the book again the strange choices and dubious pacing are a little more obvious (mostly due to the villain-an-issue structure), but there is still an intrinsic magic to the concept and plot. This is a vision of Batman’s early career that picks up on the oft-quoted but very rarely shown fact that Batman is allegedly the world’s greatest detective and runs with it all the way to the goal line. There are clues and red herrings and mis-directions and it all comes together with a perfectly satisfying conclusion by the time the story is done. Seeing the last three ‘good’ men in Gotham (Jim Gordon, Harvey Dent, and Batman) come together to instill law, justice, and order makes for a wonderful story and it’s perhaps not surprising that the best Batman movie is built on the same foundation. Speaking of films it is probably fair to say that this is the greatest Godfather comic book out there too, as it draws heavily on the Coppola film visually and the Puzo novel narratively. Again the concept shines through with a unique take on the superhero genre as Loeb takes the decision to examine the fall of traditional crime in Chicago-inspired Gotham as clown princes and other such masked super villains take over the city. After reading that first issue I was hooked and many anxious shopping trips at local comics fairs and back issue parlours followed. It took me a while to pick up every part of The Long Halloween, but it was well worth all of the searching. Tim Sale has continued to deliver amazing work since then, but the Loeb/Sale partnership never yielded anything quite so perfectly formed (even the sequel Dark Victory lacks a certain something) and I think this would probably be my choice for best Batman story too. For me it remains the quintessential tale of the dark knight; it demonstrates his detective skills as well as his physical prowess, it features his greatest allies and most dangerous villains, it paints a vivid picture of Gotham as a living place and more than just the backdrop to random adventures, and overall it makes for a compelling and beautiful read. Even after all these years and all the comics since this is still how I see the Batman, and for that I am very grateful to Tim Sale and Jeph Loeb. Magneto as the most complex, fascinating ‘villain’ in Marvel Comics. and Shakespearean tragedy with ‘Fatal Attractions’. that blew away my 13-year-old self more than this X-Men event did. the dynamics, it was all epic. X-Factor #92 has to be seen to be believed! Empire Stikes Back or Return of the Jedi. They’re that good. I used to own a copy of this comic and to this day one of my biggest regrets is that I loaned it to a kid I knew and never saw it again. Written by the legendary Larry Hama who crafted pretty much the entire series of over a hundred and fifty of these books for Marvel and ended up creating some of the most intriguing and definitely ahead of their time (and comic-medium) stories for what was meant to be just an add-on to a toy-line, this book is a prime example of what Hama and Marvel accomplished. Simply put, this is a comic that has no dialogue. 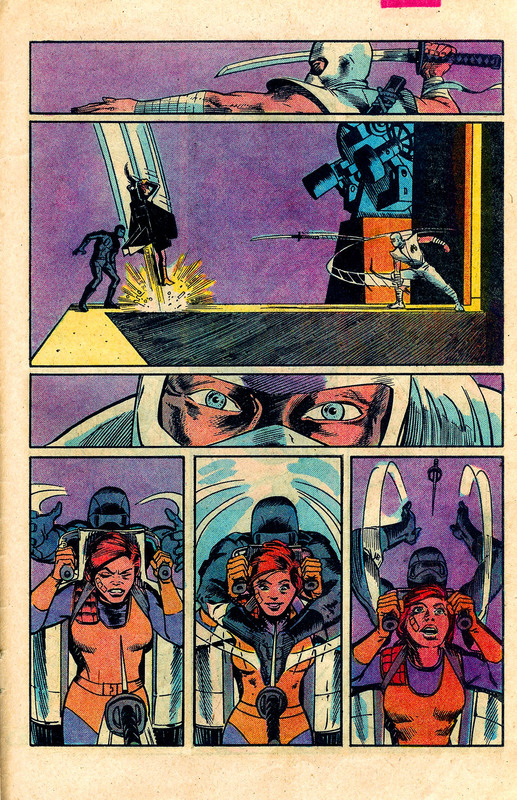 It starts off with Snake-Eyes (arguably either the coolest or most over-rated Joe ever) silently infiltrating a Cobra fortress in an attempt to rescue his comrade and beloved Scarlett. Meanwhile, in keeping with the less sexist tone of much of the series, Scarlett herself is busy extricating herself from the inside out quite capable – something that seems like nothing special until one considers how such things influence our minds as children and eventually as adults. 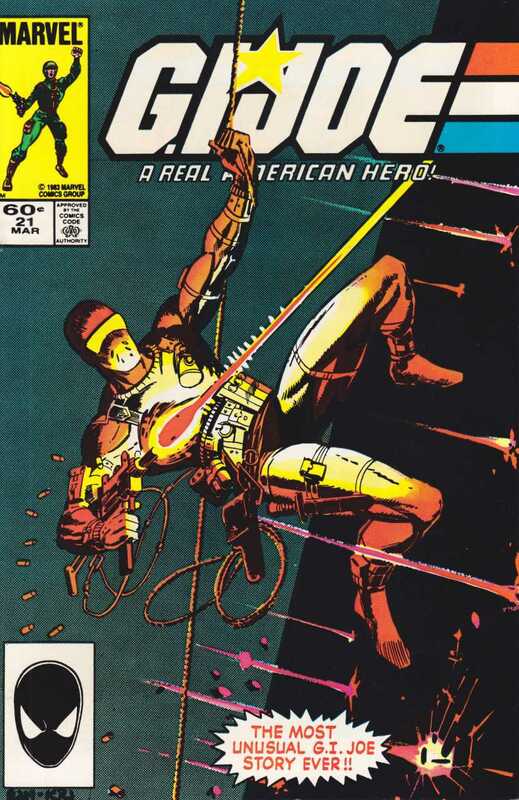 Each page was filled with tension and I would be on the edge of my seat each time I read this comic, devouring the artwork on each page as he made his way through, silently taking out guards and even facing down and defeating Storm-Shadow and his ninja’s before making an explosive exit with his target acquired. I had read none of the other comics and came to possess this in the late 80’s as a little tyke, purely by chance and knew the Joe’s only through the less intense/hard-edged cartoon series. Within these pages though I found a level of intelligent, well thought out and engaging story-telling that would never have been expected and the lack of dialogue and using visuals is a concept that has burned itself into my mind to this day with thus far two of my own published comics being in a similar vein (sans dialogue) and must I admit that until making this list I never truly realised where that interest in purely visual story-telling had been born.